You find an interesting canning recipe that you want to try. The recipe states that it yields a certain number jars, so you prep those jars and make the recipe. But you end up with way more than the recipe stated. Or worse…You get way less. What happened? Did you do something wrong? No. It’s probably not you. Sometimes, the way a recipe developer measures is different from how you do it. I don’t mean that they measure a cup of liquid or a teaspoon of spice differently. That is pretty universal. But sometimes, when a recipe calls for something that can have air pockets during measuring (like chopped apple or fresh basil leaves), the recipe developer may pack more or less into that cup than you do when you make the same measurement. And that can have an impact on the final outcome. So when you look at the measuring discrepancies described above, you can see that it all comes down to volume vs. weight in measuring. A perfect example of this is when measuring something like a cup of chopped apples. Let’s say your recipe calls for “4 cups of chopped apples”. When you make the recipe, you chop roughly and leave the chunks fairly large. If you do this, you will probably end up with less apples per cup than the person who developed the recipe. This is because there are more air pockets around each chunk filling in the space as you measure. In other words, if you were to weigh 4 cups of roughly cut apples vs. 4 cups of finely cut apples, the roughly cut apples would much weigh less. 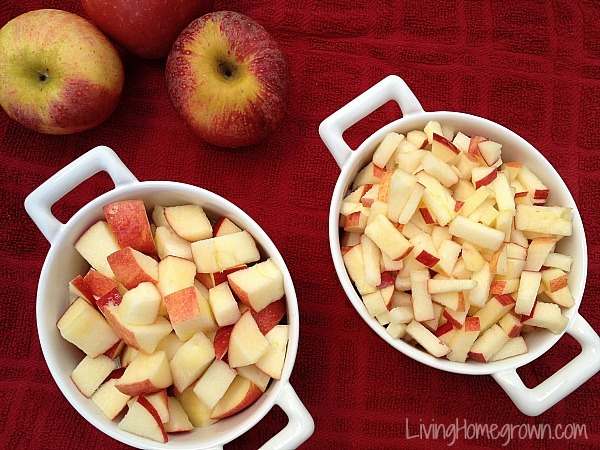 Because you can fit more apples into the 4 cup measurement if you cut them finely. It really does make a difference. This is why many people feel that you should only cook or make preserves by weight. And it is true that weight is the most accurate way to make a recipe. That is by far the best way to can. But, most people in America do not have kitchen scales. Most people here measure by volume, not weight and that’s why most American cookbooks use volume measurements or both. Although there are exceptions, in most cases it is okay to use volume measurements because most canning recipes are very forgiving. And thank goodness they are because every batch of fruit we use can be different based on the natural sugars and pectin in it. This is why some recipes act differently for us on different years or on different days. As you preserve more, you gain experience with each batch and you learn to read the signs. Before you know it, you know what to look for as the jam starts to “set” or you understand how to get a gel with temperature alone. But in the meantime, just know that this might be one of the reasons you get different results than a recipe describes. Another reason for recipes yielding more or less than you anticipate is that every piece of fruit has different amounts of water content. This can change year to year and fruit to fruit. It is all based on its growing conditions, the time of year it is picked, it’s ripeness and how long it has been sitting on the counter. In this case, it doesn’t matter if you measure by weight or volume. The water content can make a difference in how it cooks and the yield you get. If you aren’t sure, go for the fine chop. Use more fruit rather than less. Notice if they say things like: “hand-packed leaves” or “firmly packed leaves” when measuring something like basil. 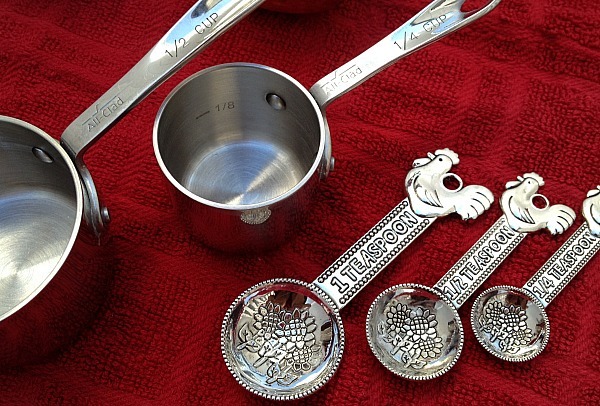 These terms generally mean that you should press the leaves down into the measuring cup as you measure them. Sometimes it will take you more or less time to gel or cook off the water in a recipe. So use cooking times as a guide – not the rule. In other words, if it says, “cook for 8 minutes or until it boils”, don’t worry if it takes you 15 minutes to get to that boil. Always prep more jars than you think you will need, just in case. 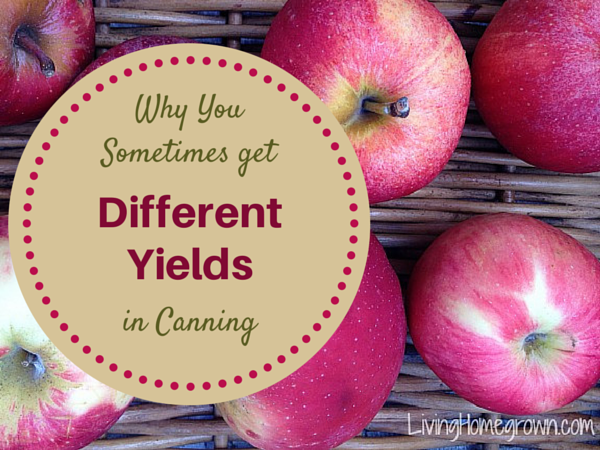 Have you ever ended up with a different yield? Do you feel better knowing that it’s not your fault? Yes, I definitely get different yields, which is why I always have at least one extra jar in my canning pot if possible (usually a full extra jar and a half size of whatever I’m making). 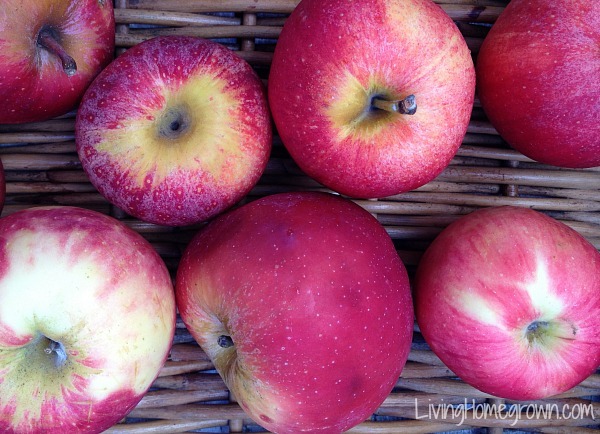 When weighing stone fruits would you weigh unchopped with pit or after, chopped? Hi Lorrie – That is a great question. If a recipe only specifies “2 pounds peaches” in the ingredients (not saying “pitted peaches” and then the first step is to chop the peaches, it could be assumed that you are weighing whole fruit with the pit. “2 pounds peaches, chopped” – which means they are already pitted. In general, most recipes would give you a volume measurement or weight for the fruit already pitted – only because it is more accurate if you are measuring the fruit in its final prepared state. I am more concerned about proper serving size than I am about yield. I have only been canning for a couple of years so my inventory of jars is small – only 3 dozen – so each time I do a canning project, every available jar is washed and sterilized. My current concern is I am wondering why my jar rack is rusting!!!! You are talking about the water bath jar rack, right? Unfortunately, most of those are made with a metal that either rusts or otherwise corrodes. You have not done anything wrong. Since they are fairly inexpensive, you can replace them periodically if you are worried about it breaking. I wish they were a little better, but they serve their purpose I guess. I’m so thankful to have found your podcast, which led me to your web site. I’ve canned for a few years, but have learned so much and gotten a lot of questions answered my little canning books don’t go into at all! Looking forward to canning this year. Thanks Theresa! !